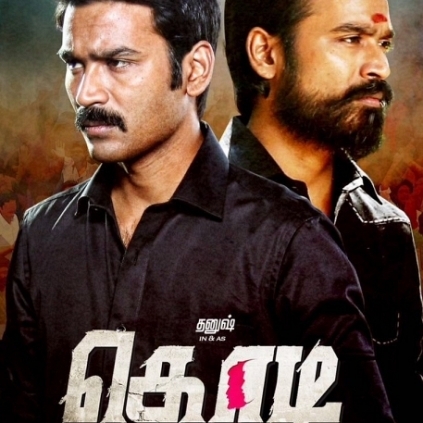 The trailer of Kodi was launched today, on the 5th of October after the audio launch event at Prasad Labs, Chennai. Does the trailer set our expectation high? Does it entice you to watch the movie? Read more to find out. The trailer opens with an intro scene of Dhanush. Moving ahead into a song, the trailer gives a glimpse of the dual role played by Dhanush. While one of the twins is a politician, the other Dhanush seems to be a calm one who shies away from all fame, popularity and politics. The bearded Dhanush exudes mass in each frame and the clean shaven Dhanush seems to shine in a subtle role. The music by Santhosh fits the bill and the art director seems to have done an apt job when it comes to recreating a rural backdrop. Trisha falls in love with the bearded Dhanush and from the trailer we can expect that they face each other as political rivals. SA Chandrasekar plays the rival of Dhanush and it seems he will be a constant trouble for the latter. There are a lot of quick-cut sequences which pump in adrenaline like the portions Dhanush faces Trisha and the punch dialogues. With a crux that fully revolves around politics, the trailer showcases the problems that Dhanush faces because of politics. Kodi’s trailer is entertaining enough. People looking for online information on Kodi will find this news story useful.